Henneken has been a socially responsible enterprise ever since it was established in 1870, although “socially responsible entrepreneurship” did not exist as a term in those days. Socially responsible entrepreneurship is about 3 aspects: People, Planet, and Profit. Henneken continuously invests in training courses to develop its employees’ knowledge and expertise to a higher level. Henneken invests in retaining its experienced employees making sure they can carry on working in their physically demanding profession so that their valuable experience remains available to our customers. For this purpose, Henneken has joined up with a sports school and developed a dedicated “movers programme” to keep its employees in optimal shape. Henneken also provides back training and lifting exercises, as well as lifestyle and nutrition courses to its employees. Sustainability is an important aspect for which we screen our suppliers. 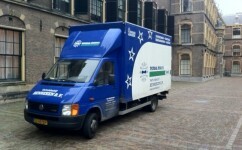 When it’s time to replace a removal van, our choice will always be for a model that leaves the smallest ecological footprint. We are striving for mileage reduction (and therefore reduced CO2-emissions) through our intense collaboration within the nation-wide Mondial Movers partnership. The removal boxes and wrapping paper we use are always manufactured of recycled paper and cardboard; returned removal boxes will be re-used multiple times and offered for recycling after their end of life. Henneken is financially in a healthy condition. And we need to maintain that condition so we can continue to invest in matters that are relevant to society.